Bring your special someone and join us for a night of crafting on Valentine's Day! 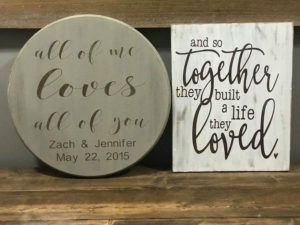 Your ticket will include: Step by step instructions to make 2 wood signs, a flight of 4 to share and 6 chocolate covered strawberries to enjoy. please email Katie at alwayscreativedesigns@gmail.com for personalization information.